It's not out yet, but according to a press release put out by Nintendo this morning, Mega Man X is slated to release on the North American Virtual Console in just a few short hours from this posting. As with all Super Nintendo titles, MMX will run you 800 Wii Points and supports play with either the Classic Controller or GameCube controller. Unfortunately, there is still no word on a European release. I imagine that, having released in Japan just a few short weeks ago and hitting the U.S today, an EU version shouldn't be too far off from now. In another bit on Virtual Console news, it appears Mega Man 5 might be just around the corner. The ESRB has rated Mega Man 5 for Wii within the last 24 hours; a clear indication the game is being prepped for a Virtual Console release in North America. No word on Japan or Europe at this time, but we should that news should trickle out in the near future. PLEASE be an indication that Mega Man 11 is coming. please. Ooh, surprise. I own the SNES version and the Gamecube collection though, so I have no need to buy it. @AsianSteev: Why does Megaman 5 indicate Megaman 11? Is there any chance this will come to XBLA? I have the MegaMan Anniversary Collection and MegaMan X Collection for GameCube, so there's not much reason for me to download this. It would be nice to have it on Xbox though. @JImb0: Not a coincidence eh? Oh look! New Sonic game. That must mean Nintendo's making a new Mario. Three classic series games in a row? As long as it's not 8-bit. Some people might like that, but I feel the amount of people who'd go meh would also be high enough. I see things to come..
@TAG: I'd have to say that I'm the same way. And man, I'm really hoping that Mega Man 11 is coming! I have to admit that recent developments at Capcom have made me a little worried about the future of the franchise. This game is too awesome, even after all these years. Playing it again reminds me how great the SNES X games were. Too bad it didn't last. "Oh look! New Sonic game. That must mean Nintendo's making a new Mario." Harhar. You don't get it. Capcom releases MM games on the VC only for the sake of promotion. It's used to garner hype for a new game. I'm definitely keeping my fingers crossed for Mega Man 11 and/or X9. Either one is fine with me. "There will be no Megaman 11, forget it Inafune is gone"
guess it's time to shut down the rockman corner, protodude. was a good run while it lasted. @Jimb0: Oh no, I get it, I just don't think there's enough of a correlation to think it has to mean MM11. They wouldn't need any help getting the hype machine going anyway. You know Inafune didn't write, direct and make the music for every single mm game right? In fact most of the time he sat back in a producer type of role. Hell he's not even the real creator. His only role in X5 according to the Complete Works artbook was that he told the X5 staff to end the series. That's it. MM will exist without Inafune, because the men and women who worked on MM for 20 years are still with the company. It's insulting to say MM is dead without Inafune... though Capcom's recent treatment of the series is kind of telling. I can't help but facepalm whenever people say things like this. If Mega Man games weren't made for that reason alone, then Mega Man X6 wouldn't exist. Also, Yuji Naka left Sonic team a while ago, and yet there's still been plenty of Sonic games that have gotten released. AWESOME! 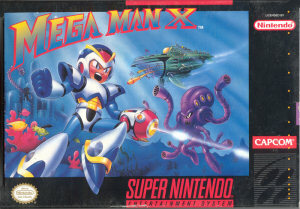 I was just playing MMX on my Retro Duo last night and was thinking of the VC release and here it is! Must have anew megaman 11 in console everyone loves megaman right? I love Megaman.